Dancing Violet Designs: Free sample patterns for several rugs and Christmas items. A larger collection of patterns is available for purchase. Dollhouse Needlepoint Patterns and Kits: by Natalia Frank. Free patterns for reproductions of antique rugs and pillows. For personal use only. Janet Granger Designs: Extensive tutorials and detailed info about miniature needlepoint, including materials, techniques, finishing, and items to make with your needlepoint. Rotating free chart available. Kreinik Freebies Project Archives: Free needlework projects, some are mini scale and other patterns can easily be used for miniature pillows, rugs, etc. Be sure and check out the cross-stitch, needlepoint, & crochet sections for mini-convertable projects. Reading and Stitching: How to Park Threads: Excellent article explaining the process of parking threads in miniature needlework. Miniature Needlework Society: Founded in 1997 to encourage all forms of miniature work with needle and thread. Embroidery, Needlework, & Samplers: A collection of articles from Victoriana Magazine. Interesting topics include Southern Decorative Needlework, Victorian Knitting, English Samplers, and Undersleeves in French Embroidery. Patches from the Past: Articles covering textile and quilting history from ancient Egypt to early America. Learn about needlework styles around the world, heritage quilts, African-American quilting, and much more. Ukrainian Cross Stitch Page: A fascinating look at the importance of cross-stitch art in Ukrainian tradition. Sample patterns for towels, shirts, blouses, carpets than can easily be done in miniature scale, as well as a very extensive motif pattern catalogue. Buttercup Miniatures: Miniature knitting & crochet patterns, yarns & supplies. Great kits & patterns for period clothing, accessories & toys. EsthersMiniatures: (formerly Magic Miniatures) Needlepoint kits & downloadable charts for tapestries, cushions, carpets, runners, fire screens, and more! Also an extensive line of mini-scale printed fabrics. Janet Granger Designs: Gorgeous dollshouse needlepoint kits for rugs, footstools, bellpulls & more. Jan's Minis: Miniature knitting patterns, yarns, trims, & other supplies. Melissa's miniwereld: 1:12 and 1:24 scale cross-stitch kits for pillow, carpets, and framed art. Site is in Dutch, there is a translator in the sidebar. microStitchery: by Bobbie Schoonmaker. Museum quality needlework & kits for silk gauze embroidery. Mini Stitches: by Annelle Ferguson. Beautiful adaptations of historical samplers and seat covers are offered in kit form. 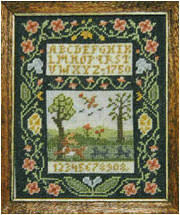 Stitches In Miniature: Miniature needlepoint rugs kits and fabrics for dollhouses and miniatures.